Wow, I can’t believe a week ago I was in Las Vegas for the jewelry shows — it’s like I blinked and I was flying back home! This year’s Couture Show was extremely memorable — for one, I visited 37 different designers in just two days! I have no idea how I pulled that off. This year I brought along some help who turned out to be A LOT of help–photographer Lauren Newman, who has shot a few campaigns for me in the past. She recently moved to California, so I was hoping to find an excuse to reunite with her, and I loved showing her what Couture is all about. There is something special about watching a newbie get to experience Couture for the first time. 1 — David Webb: I was looking forward to seeing what would be brought along to Couture this year, as last year was simply magical. This year’s bounty was just as good and the coral tassel earrings seemed to have grabbed my attention. I wore tassel earrings on my wedding day, so this style easily wins for me every time. 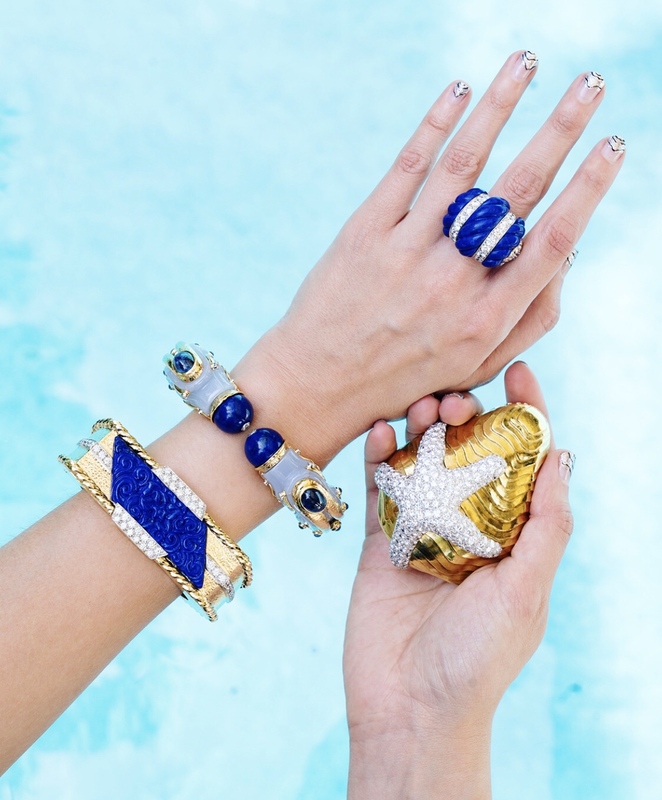 Coral beads, sapphire beads, diamonds and white enamel make up these handcrafted stunners. I also have a thing for David Webb’s totems and this one paired perfectly. 2 — ELeKarela: I’ve been a huge fan since finding this Greek jewelry designer on Instagram. I love her use of unique stones, all the colors and boldness of each piece she creates. These pendants are my favorite! The cloud pendant actually features a real oil painting the designer painted herself, set under a convex crystal. Moda Operandi is currently featuring her work, here. 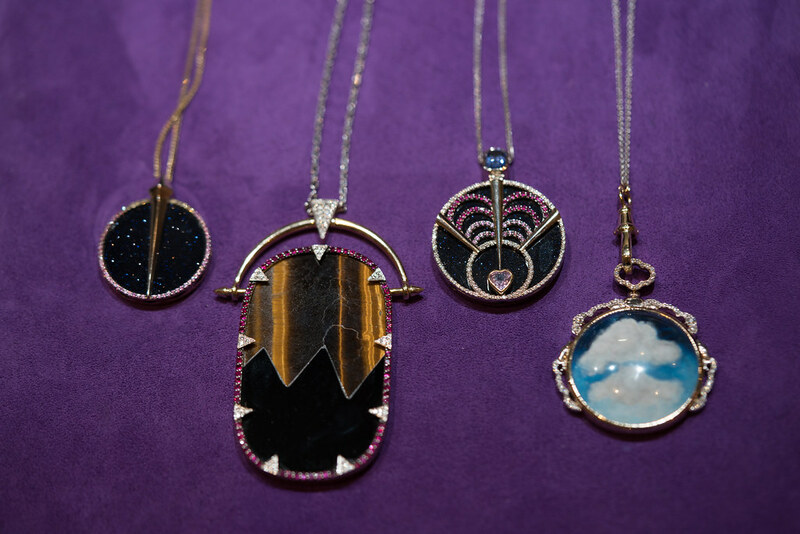 3 — Celine Daoust: between this designer’s cool and collectible pendant necklaces to these fun rings, I was swooning hard for Celine Daoust. Her pieces were high on my list of things I would actually want to buy myself and wear all the time! She hails from Belgium and although she wasn’t present at Couture, I felt her spirit through her designs and could easily see her passion. Stay tuned to our Instagram page, as we will be hosting a really exciting giveaway from Celine! 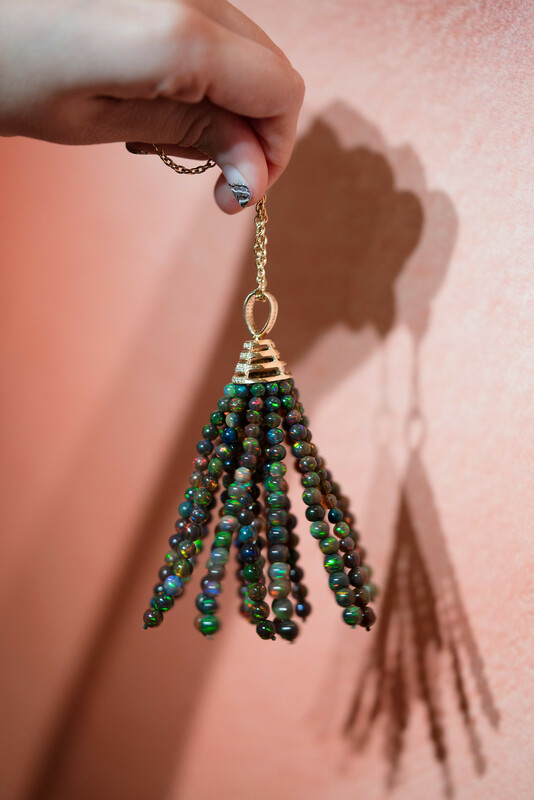 4 — Goshwara: Again, I have a thing for tassels…how incredible is this pendant?! The opal beads are out of this world, they are simply glowing. The diamond encrusted cap adds some elegance and refinery to such a fun piece. I really enjoyed my time at Goshwara and hope to visit their headquarters in NYC someday soon! 5 — Ana Katarina Design: Aquamarine clouds?! I never knew those could be possible, but I’m so glad I found designer Ana Katarina because she makes the most incredible, dreamy pieces. The designer has three daughters and is continually inspired by women worldwide. She also uses recycled, reclaimed precious metals and materials in all her creations. Her Cloud 9 collection is easily a favorite! See more from my Vegas adventure, check out my Instagram page. Opal is always my favorite. That tassel pendant made by small opal pieces looks soooo cute. 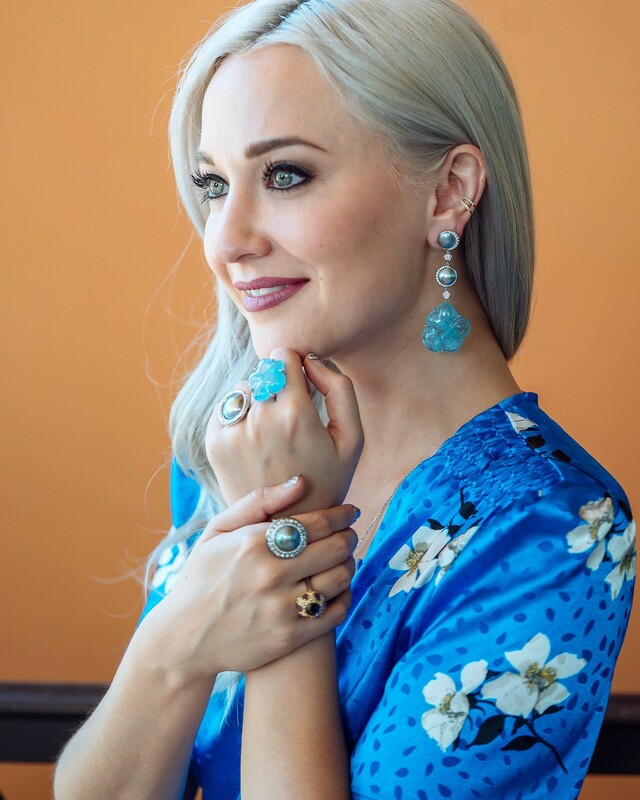 Although there all represent such beautiful artistry and design, my favorites were David Webb (especially the gem inlay/art deco pendant, the tassel earrings, and the cuff); the Goshwara tassel pendant (those fire within those opals); and the Ana Katarina Design Cloud 9 jewelry (STUNNING). I am never able to attend these jewelry shows since I am not a buyer or traveling with a buyer. 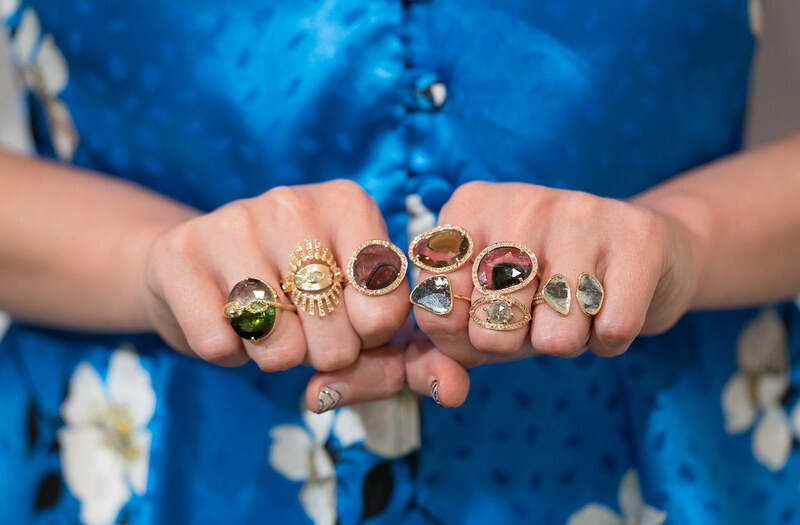 So I highly appreciate you sharing your jewelry show experiences with us. It allows us to peek behind the curtain and experience the wonder through your eyes. THANK YOU!! !